We visited Robbers Cave State Park in Wilburton, Oklahoma this weekend and it was a blast! This park is only a couple hours drive from our Okmulgee home and it offers loads of healthy, affordable fun. Robbers Cave State Park has three small lakes that are all excellent for novice canoe and kayak paddlers to give the sport a try. Lake Carlton is located right by the park office. This tiny lake offers canoe, kayak and pedal-boat rental and a lovely swimming area set against a backdrop of rocky bluffs covered in cedar, pine and assorted hardwood trees. Although, my first visit here was in the summertime, I imagine it must be stunning in the Fall. The lakes are free of fast boats and jet skis which makes them excellent for teaching the basics of paddling to kids. Also, the small town of Krebs, Oklahoma is right on the way to Robbers Cave State Park from our house. Krebs is a town built by Italian immigrants and the opportunity to catch a meal there is reason enough for an Oklahoma Road Trip! Although most places in this town serve dinner only, you can catch lunch at a couple of place. Find one…it is worth it! In addition to the lakeside swimming area, there is a large pool nearby and adjacent to the gift shop is a Nature Center for learning to recognize the native plants, animals and insects in the area. Now I know why the goldfinch feeder I bought on sale a month ago hasn’t attracted any goldfinches. It turns out that goldfinches are winter birds in Oklahoma! The Kids Will LOVE the Hike…So Will You! Hiking up to Robbers Cave is, of course, the main event at Robbers Cave State Park. Do not leave the park without taking this excellent hike. Although you will see folks breaking out rock climbing equipment and rappelling gear, most folks from 10 to 60 should be capable of walking to the top safely (if not quickly). The trailhead info says that the climb is equivalent to climbing eight flights of stairs and takes about one hour. It is, without a doubt, the best little hike I have ever been on and it was great to see how much Dylan enjoyed it! My favorite part of the hike is The Stone Corral. The outlaws that used to hide out in these caves included folks like Belle Starr, Jesse James, Cole Younger, etc. They used The Stone Corral to conceal their horses. I walked up to The Stone Corral on a hot, windless day in the summer, but I swear that a constant breeze moved through the rock-surrounded area while I was there! Although non-hikers can walk up this hill, you will enjoy yourself more if you follow the following tips. Wear snug fitting shoes with good traction, you don’t want to risk slipping and falling. If your shorts are very long, roll them up. Take some water. take a camera and take your time. It was a hot walk uphill in the summertime, so the best advice I can give you is to leave early. The trail opened up at 8am and it started to get a little crowded with Boy Scouts ands such around 10:30am…right when the temps were rising and we were leaving. Wilburton, Oklahoma is not a huge town so the lodging options are somewhat limited when visiting Robbers Cave State Park. On the first night of our trip, we stayed in one of the park’s two bedroom cabins. The cabins are not fancy. but they are comfortable and they tend to be booked up early on weekends. Right by our cabin was the park lodge called the Belle Starr View and the park offers group camps, tent camping and horse camping as well. To feed the internet addiction of our family we spent the second night of our road trip at Wilburton’s Hiway Suites and Motel. Their king rooms are also not fancy but comfortable and we found a decent WiFi signal right away. After an afternoon swim in the pool and some satellite TV, we awoke refreshed for another day of fun at the park. Although there are several walking trails to explore, on Day Two we decided to paddle Lake Wayne Wallace instead getting lost in the woods. This lake is just a short drive from Lake Carlton, but it is more isolated and scenic. Lake Carlton is scenic, but with the boat rental, a shaved ice stand, pool, waterslides, swimming area and floating docks…it is anything but isolated. Young people play gleefully in all directions at Lake Carlton. Lake Wayne Wallace was much more my speed. Dianne and I paddled it early in the day until lunchtime and we only saw one other person…at a distance. Both of these park lakes are small and surrounded by beautiful trees, stone formations and high scenic bluffs. If you have been waiting for an excuse to buy a new high capacity memory card for your digital camera…this trip will justify it! My son Dylan had heard about the Heavener runestone and expressed an interest in seeing Oklahoma’s most famous Viking artifact. Since the trip would take us even deeper into the Ouachita Mountains, I was definitely up for it. It would appear that sometime around 600 AD, some Vikings made an Oklahoma Road Trip of their own. Scholars believe they traveled up the Mississippi River and laid claim to land that would one day become Poteau, Oklahoma. The Heavener Runestone is said to be a property claim marker for a Viking named ‘Glome’. I was surprised to learn that other Viking Runestones had been found around Oklahoma including a Shawnee Runestone in nearby Shawnee, Oklahoma. What About Thrilling Whitewater Excitement? We made a brief stopover at Lake Wister on our way back to Wilburton and our kayaks were in the back of the truck. Lake Wister is releasing huge volumes of water now. Below the dam release point there was some mighty frothy whitewater and lines of fishermen on each shore. They were pulling 45 pound catfish out of this area with rods. I was surprised when one of them asked me if they would like to pull their lines in so we could run the whitewater in our kayaks. First of all, neither of our kayaks or our skills are up to snuff for this run. Even if we were paddlers enough to survive, the smell would gag a maggot. Apparently, the lake is ‘turning over’ as it does every summer. The water has a yellow tint and an almost overpowering smell of sulphur (rotten eggs) fills the air around the dam release. I was standing on the bank about ten feet from the water and I could see fish just beneath the surface. I couldn’t help wondering if it had any impact on the flavor of the catfish…it sure put me off my feed for awhile! 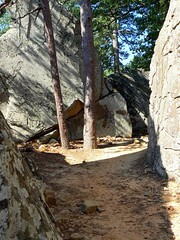 Robbers Cave State Park in Wilburton, Oklahoma has a wide assortment of Nature Trails, Mountain Biking Trails, and Equestrian Trails. If you take a notion to do some wandering partner, this place has got trails! Dianne and I took Dylan and Dianne’s Mother Juliene and we all found fun activities to enjoy at this park. I can’t remember when I have enjoyed such cheap fun. Since we had our own kayaks (only two boats to share between four people), we spent nothing on activities. The hiking and boating and Viking History lessons were all free. For the drive home, we decided to skip the Indian Nation Turnpike and take Highway 69 instead. Highway 69 crosses Lake Eufaula at in several places like Rock Creek, Coal Creek and Crowder. I'll have to get back and paddle that part of Eufaula one of these days. My wife and I spent one weekend with my son and mother-in-law in a Robbers Cave cabin. I would not describe the cabin as luxurious, but I would stop short of sleazy. It was roomy enough and quite clean. Everything worked and it was economical due to the full kitchen...no jacuzzi. Wilburton is not a very urban area, so there are not a large number of restaurant choices. My advice: only enter the cabin for sleeping, spend your days outside and take in the natural beauty and well marked trails. Expect to enjoy awesome hiking and sight seeing. The area is lovely with several small lakes that are excellent for recreational kayaking. Canoe and kayak rental is available on site as well as a cool little museum, gift shop and live reptile display. Simply a great spot to bring the kids for outdoors fun. Current Kayaking Conditions Are Cool!